It's no wonder that Italian phrases like La Dolce Vita and Bellissimo roll off the tongue, life truly is sweet here and there's plenty deserving that tag of beauty. 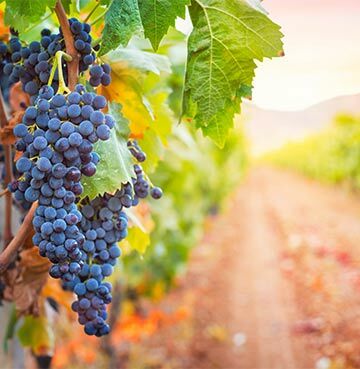 Imagine that first sip of local wine, as you tour an Italian vineyard! Or picture the smile that hits your lips and you lock eyes on a historic sight that's long been at the top of your bucket list. From stunning natural beauty to beaches so stunning you'll be picking your jaw off the sand, there's just so many wonderful things to do in Italy. No matter how you love spending your getaway, Italy will capture a little piece of your heart – your new holiday amore. There's a reason they call it the great outdoors and in a country with as much natural beauty as Italy, the outdoors is greater than great! Awe-inspiring and jaw-dropping sights await. 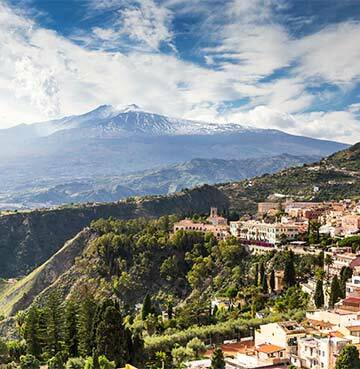 What better place to start than with Europe's largest active volcano, Sicily's staggering Mount Etna! Still bubbling away, its glowing red craters are a mesmerising sight. Swirling and bubbling, you could watch the lava dancing around for hours. The beauty is that you can get up close and personal, seeing the effects of its fairly frequent lava flows. Mount Etna National Park covers over 224 square miles, offering wonderful chances to hike around its varied terrain and scenery. A fascinating blend of black sand, volcanic rocks, craters, woodland and snow-capped peaks – your eyes will be darting from brilliant sight to brilliant sight. You don't even have to get too close, on clear days Etna is visible from over half of Sicily. 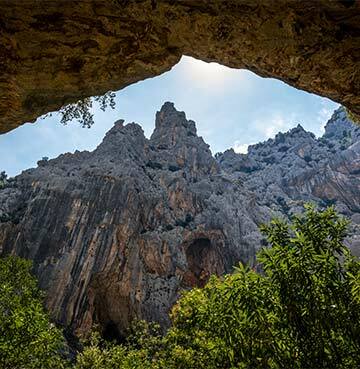 Sardinia's Gorropu Gorge lays down the gauntlet to hikers that love a challenge! Fancy conquering the two hour hike from the car yourself? A rocky canyon carved by Flumineddu River is the prize for completing your mission. Up to 500m high and as narrow as four metres in places, look out for caves dotted along these captivating cliff faces. Hopping in a jeep tour cuts your hike down to 40 minutes, a far more manageable trek for those who are a little less enthusiastic about exploring on foot. Puglia is home to alluring caves of its own, with more than a mile of underground passages waiting in the Castellana Caves. River water has eroded the rock into these marvellous caverns, decorated by stalagmites and stalactites that hang from walls and ceilings. You might have visited caves before, but Castellana is home to a few surprises that are bound to impress! Grotta Blanca is named after its brilliantly white rock, while the Passage of the Nativity Scene is home to a formation resembling the Virgin Mary. The Little Madonna of the Caves is a sight to behold! We'll leave it to your imaginations to decide what waits inside Owl Cave, Black Cave and Snake Corridor. We might have mentioned it once or twice already, but the Amalfi Coast just loves to do things differently! Adding a little of that Amalfi charm that instantly has you falling in love. So it won't surprise you to find out that its Emerald Grotto follows this bewitching trend. A shimmering green pool is hidden away in the Grotta dello Smeraldo, illuminated by sunlight entering the water through an arch below sea level and reflecting off the cavern walls. Forget everything you knew about beautiful shades of green, the Amalfi Coast is about to blow your mind. Is there anywhere that can boast as many marvellous wine regions at Italy? The clink of wine glasses carries across countryside, the pop of corks going in and out of bottles echoes around islands – vino is synonymous with this wonderful country! A drive around Sardinia soon gives you an idea of just how ingrained it has become into daily life. Mini-vineyards are dotted around farms and houses, with locals transforming their grapes into hand-crafted homemade wines. The sea not only separates Sardinia from the mainland, it has also allowed the island to create its own grape growing identity. A glass here often whips the taste buds into a frenzy, with hints of French tones and Spanish influence. Cannonau varieties even use the same Garnacha grape found in Spanish wineries, although the island's altitude and climate gives its reds a much deeper flavour. Vermentino is incredibly fresh and certainly worth trying if you love zingy white wines. You can almost guarantee that when you pick up a restaurant menu, there'll be a local wine to compliment whichever dish you order! The island is known for its seafood and Alghero is famous for its lobster, tasting even more delicious when paired with the right wine. And you might even be heading home with a cheesy souvenir. Sardinia is home to more than 3 million sheep, with their milk whipped into pecorino cheese and ricotta. Traces of grape growing dating back thousands of years have been found on Sicily's shores, so it's no wonder it's such a wine powerhouse. Marsala is one of the island's finest bottled exports, with its dry and sweet flavours. And it's not just poured into glasses but also delicately tipped and generously splashed into pots and dishes in Sicilian kitchens. It also has an interesting tale to tell, with a little English influence in its success. A sailing merchant arrived in this part of Sicily, falling in love with a local wine – choosing to export this, he added Brandy to ensure it made it back home with its flavours and texture intact. Tuscany is loved by wine enthusiasts all over the world, with its bottled delights taking pride of place in many wine racks and collections. The Sangiovese grape is at the heart of its success, with its versatility a key factor in the vast array of reds produced here. Chianti is arguably one of the finest and most well-known and it's easy to understand why. Dry and fruity, it works with so many different dishes – which leads us nicely to Tuscan cuisine. No frill recipes, packed with fresh local ingredients and dished up in hearty portions, these are kitchen traditions dating back hundreds of years. Restaurants here promise that kind of 'you know exactly what you'll get' level of reliability and very few leave feeling disappointed. If you like the sound of Tuscan cooking, you'll love Umbrian cuisine. Just as reliant on fresh produce and seasonal ingredients, the Green Heart of Italy also throws in a few delicious surprises. 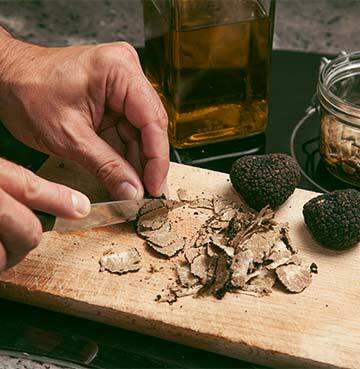 As Italy's largest producer of black truffles, these culinary delights are part of the everyday menu here! Known for its cured meats and olive oil, we might have undersold just how tasty the Umbrian menu is. Being rough around the edges might not sound like a compliment, but it really is when it comes to Puglian pasta. Orecchiette has been made by hand since the 13th century, a process that gives it a thin centre and rough edges. The shape of these 'little ears' means that they work with all types of sauces, a versatile treat for pasta lovers. Tuscany might be known for its wine, art and history, but it has a truly wonderful trick hidden up its cultural sleeve. And we'll give you a hint, it involves golden sand and blue seas. Tuscan beaches remain slightly off the radar, so a second wave of surprise washes over you when you discover just how beautiful they are! Trees decorating the shore add an extra level of natural beauty and the waters are so clear that you can see to the bottom, watching the fish swim around your feet. Cala Violina and Le Rochette are stellar examples of Tuscan beach beauty, ideal spots for a dip or relaxation on the sand. If you're feeling adventurous, why not head for the islands of Elba and Giglio? The beaches here feel like the pick of the bunch, coming with a hefty dose of island charm and tradition. Why dip your toes into the island life when you can dive right in!? Sicily and Sardinia are home to some of the finest beaches in Italy and beyond, offering beauty, variety and so much choice. You'll feel like a kid in a sandy sweet shop! If you're longing for something out of the ordinary, Sicily's Turkish Steps are an absolute delight. Wind and waves have carved the limestone into a series of rocky platforms, flat enough to lie on your towel and listen to the sound of the sea. How about a protected nature reserve visited by loggerhead turtles? The quiet and peaceful Torre Salsa is a sanctuary for animals and laid-back beach lovers alike. Sardinia's no slouch when it comes to unique and awe-inspiring beaches itself. Cala Goloritze might be a little tricky to get to, but this is all part of the charm. Tucked away behind the towering rocks, these craggy sculptures offer an amazing backdrop to your idyllic beach day once you reach the sand. Spaggia Su Portu's curving arc isn't just a wonderful beach, it also gives you the chance to spot Sardinian wildlife. Once you've taken a dip in its clear and shallow waters, head for the lagoon behind the beach - where a pink surprise awaits. Flamingos wade in these waters, the salmon coloured cherry on your beach day cake. 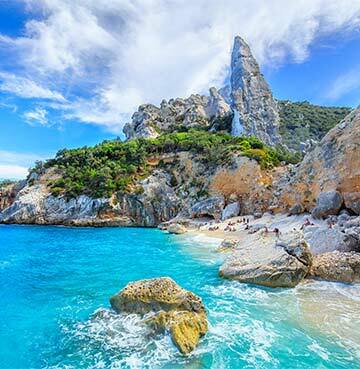 Cala Brandinchi is the quintessential Sardinian beach, blessed with white sand and perfectly clear waters. 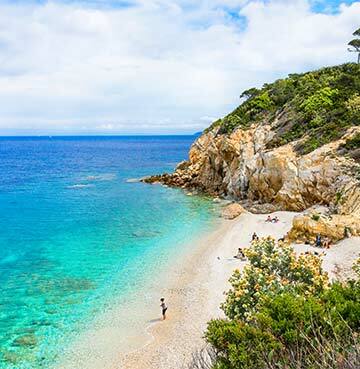 The fact that it's often referred to as Little Tahiti tells you everything you need to know about Sardinia's exotic charm. Everything along the Amalfi Coast seems to have been sprinkled with a little extra charm and its beaches are no exception! Marina Grande easily belongs on a postcard or artist's canvas, sitting below the colourful cliff face houses of Positano. Lively, looking out to islands offshore and an excellent spot for a swim – this beach has a unique allure. Furore's beach is a stunning natural beauty, often drawing comparisons to a fjord! This small cove sits in an inlet, flanked by towering cliffs and capped perfectly by its arch bridge. From Grande, to the grander and now for something small and quirky – Marina di Praia. A modest beach decorated by a smattering of blue umbrellas and upturned fishing boats sat on the shore – a colourful decoration against the cliffs behind. If you were writing an Italian history book, you'd have to dedicate two chapters to Tuscany! And the more you'd write, the longer those chapters would get. Tuscany is jam-packed with cultural delights and historic sights, brimming from the famous cities of Pisa and Florence. Both day-tripping distance from our villas in Tuscany! And with so many monuments in walking distance of each other, what better way to stretch your legs once you arrive? Pisa is so much more than a leaning tower – take a stroll along the river banks and you'll soon find out. Museums sit in traditional buildings, impressive palazzos stand proud and Gothic churches provide a unique contrast – all overlooking the water below. For a taste of the medieval, head to Knights' Square. Once Pisa's political heart, it's decorated by historic buildings that wrap around the piazza. Florence is blessed with a sight that brings new meaning to standing the test of time. 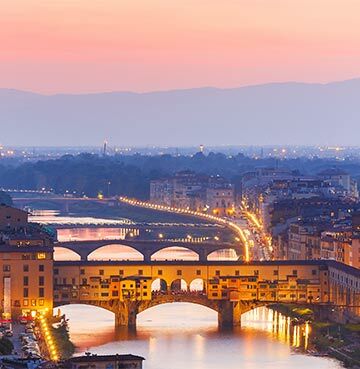 In fact, the Ponte Vecchio has withstood the bursting of the Arno's banks and was the river's only bridge to survive during World War II bombings. The 'Old Bridge' is here to stay! And if it's a palazzo that really gives you that history buzz, you'll be spoilt for choice. Florence's fantastic palaces give you a glimpse behind the royal curtain, a peek at medieval warfare and a hefty dose of modern art. Sicily's history is as diverse as they come, boasting a who's who of empires that came, saw and conquered! Arabs, Normans, French, Spanish and more all arrived on the island, planning to use its enviable location to their advantage. And each left their mark – an ingredient in a dish here, a design trick there. Palermo is the ideal spot to take this all in, with architectural styles clashing and taste buds tickled by a multitude of cuisines. You can travel even further back in time, admiring Greek relics and Roman monuments. The seats of Taormina's ancient theatre look out towards Mount Etna and the sea, while the Temples of Selinunte are remarkably well preserved. 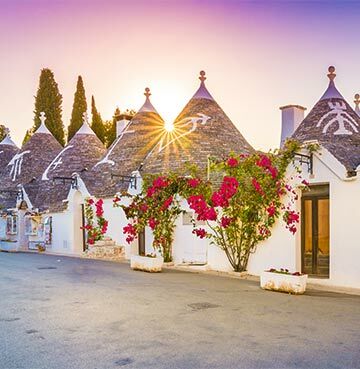 When it comes to Puglia, there's truly only one place to get your cultural fix – Alberobello. Its traditional trulli houses are an impressive sight, with their brilliant white limestone topped by a conical black roof. Against this backdrop, the flowers, decorations and trinkets sold by locals all become irresistibly eye catching and wonderfully photogenic. And if we're talking about photogenic cultural hotspots, it doesn't get much better than the Amalfi Coast! Where colourful houses clamber up the cliff-face, the ideal backdrop to the kind of coastal charm that just oozes style and sophistication. On Sardinian shores it's Alghero that takes many of the cultural plaudits, with its historic centre at the very heart of this. Wrapped in sea walls, this is where labyrinths of narrow lanes guide you out into charming piazzas. That's if you're not draw into one of the tempting cafes that line these side streets! Just be sure to pull yourself away from that rich cup of Italian coffee for long enough to enjoy the impressive Church of San Francesco and 14th century cathedral. Not far from here, you'll find another cornerstone of the island's history in the Nuraghe de Palmavera – a settlement that's almost 4,000 years old. These circular huts and palace ruins built from interlocking stones have remained in a staggering condition, impressing even after all these years.